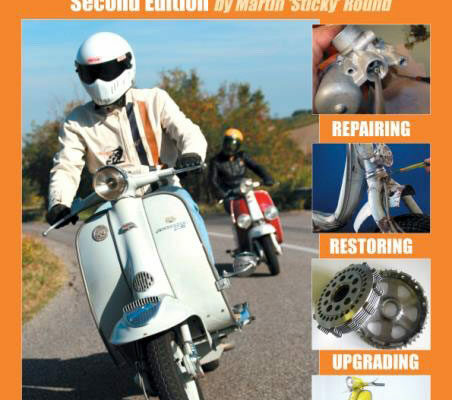 The Complete Spanners Manual has become the go to Lambretta Bible. 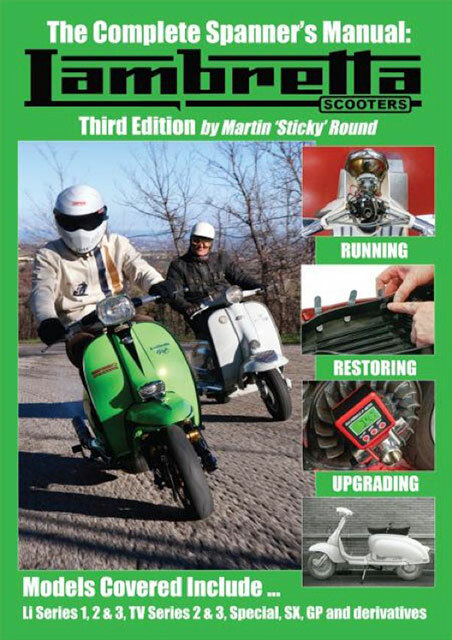 Written, tried and tested by expert and Lambretta nut, Martin Round. 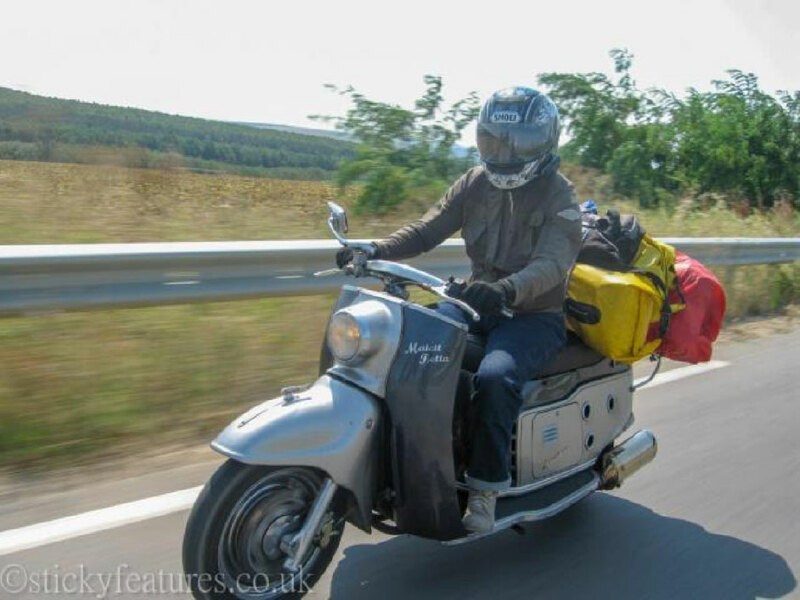 Martin, aka ‘Sticky‘, is well known within the UK Scooter scene for being one half of the original ScooterLab.UK team, and for documenting his two-stroke travels to eastern Europe in Frankenstein Scooters to Dracula’s Castle. His two-wheeled passion started aged 16. 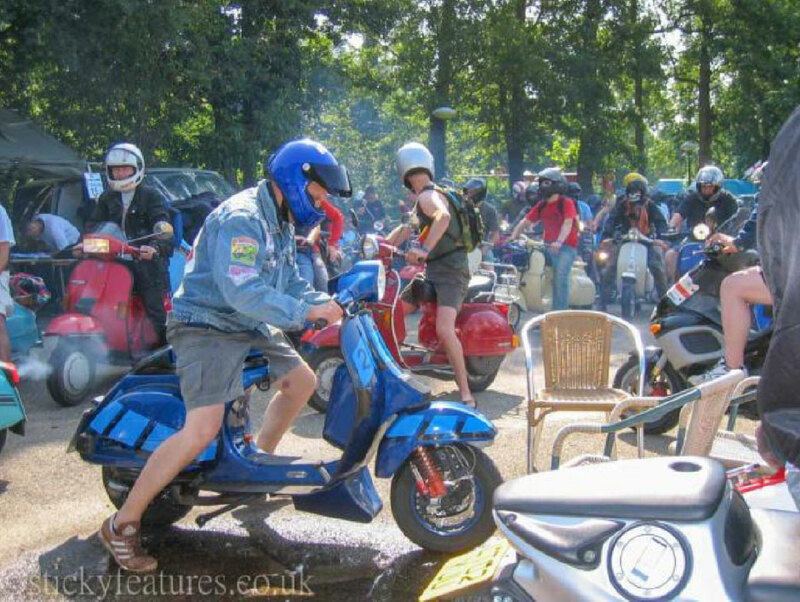 Being a school boy influenced by the Scooter Boy style, attending the 1984 Isle of Wight Scooter Rally on his Vespa 50 sealed the deal for life. Aside from writing, you wouldn’t be surprised to learn that Sticky’s garage is a hive of activity. 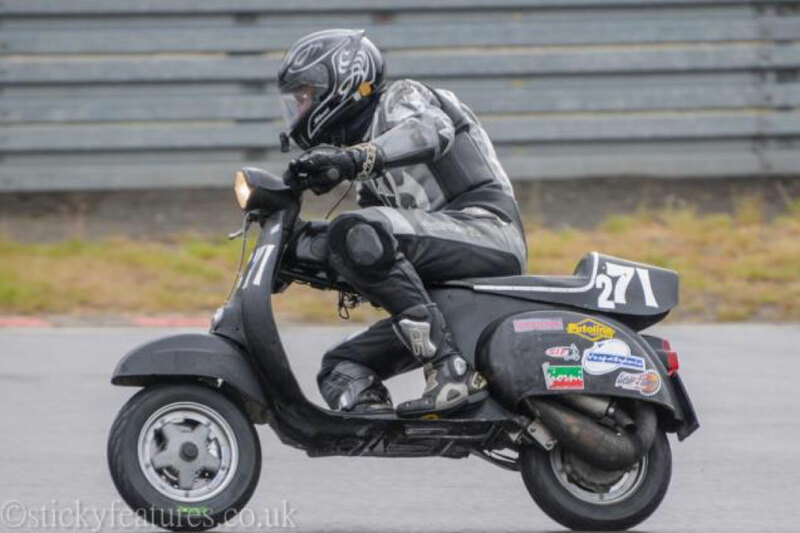 He has a few Scooters that have been previous magazine features including ‘Underdog’ – a sought-after Vespa SS90 racing scooter that Sticky bought from famous racer Norrie Kerr, and that gave him a class win at a 6-hour endurance race in Spain! 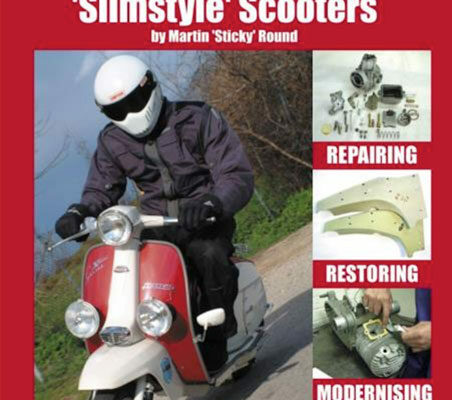 But, more recently, Sticky mostly uses a Lambretta which is converted to accept a Honda CRM250 enduro motor. 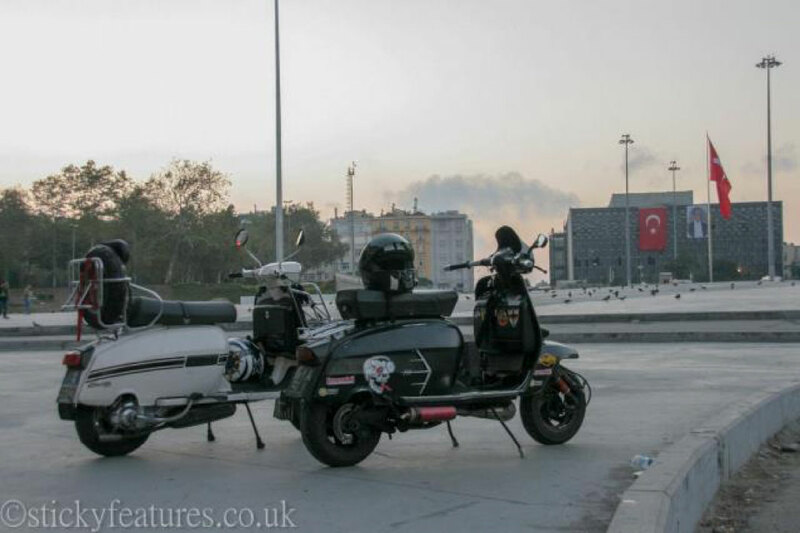 With many conveniences of a modern 2-stroke engine such as 6-gears, oil injection and a balance shaft to reduce vibration, it was this Lambretta that he rode to Istanbul with his son in 2013 and on the Frankenstein Scooters to Dracula’s Castle trip. 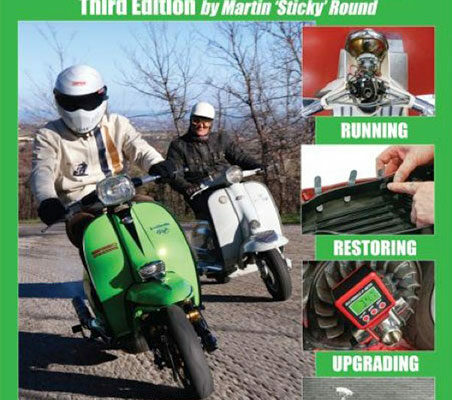 So, with a revamped and updated Complete Spanners Manual 3rd Edition hitting the retailers, we caught up Sticky to chat Scooters, road tripping and the Book! Where did the Complete Spanners Manual start? It was an 18-month project that started in 2003. The concept was to do something similar those famous UK automotive manuals but about a Lambretta, because at the time nobody had. I really thought I could improve on those with colour images, on nice paper, but the project snowballed into something much more detailed that I ever imagined! Credit must go to Dean Orton of Rimini Lambretta Centre who helped me with the chassis sections and Mark Broadhurst whose info formed the basis of the engine sections. I knew a fair bit about Lambretta’s having ridden, rallied and raced them, but they did more than fill in the gaps. Edition 1 was a massive success, selling 15,000 copies up until 2010, when we brought out Edition 2 and added information on the now very popular LI Series 1 and 2 wide-body models. What spurred you on to overhaul the book and write the third edition? 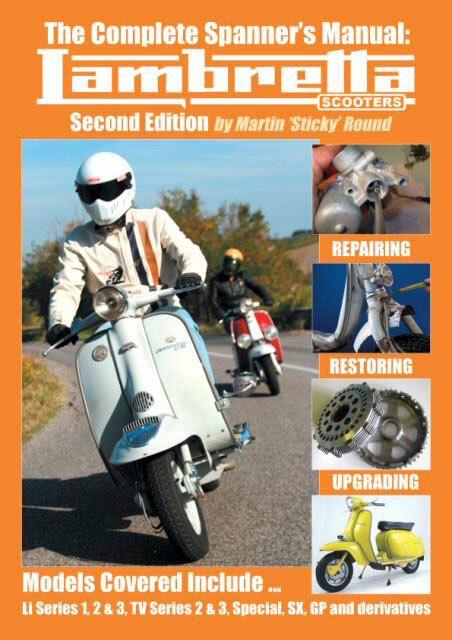 As of 2017, we’d sold another 15,000 copies so we needed a third edition – which we launched in August this year at the Isle of Wight Scooter Rally. Tell us what readers can expect to find in this edition? There are no new models but there’s an extra 48 pages covering new techniques for engine building, chassis dry building and covers many of the performance and safety updates that have appeared in the last eight years. You’d expect design of new parts for a long defunct 1960s scooter to have slowed by now, but if anything, the pace of development has accelerated in recent years. Now, if you have the money it’s easily possible to take out the original 10hp engine from your Lambretta and replace it with one that makes 50hp and exceeds 100mph with ease! Obviously if you increase the engine performance like that, then you’ll need to also upgrade the brakes and suspension to cope, so the market for such parts is massive at the moment. What part of making the moment stands out the most over the years? 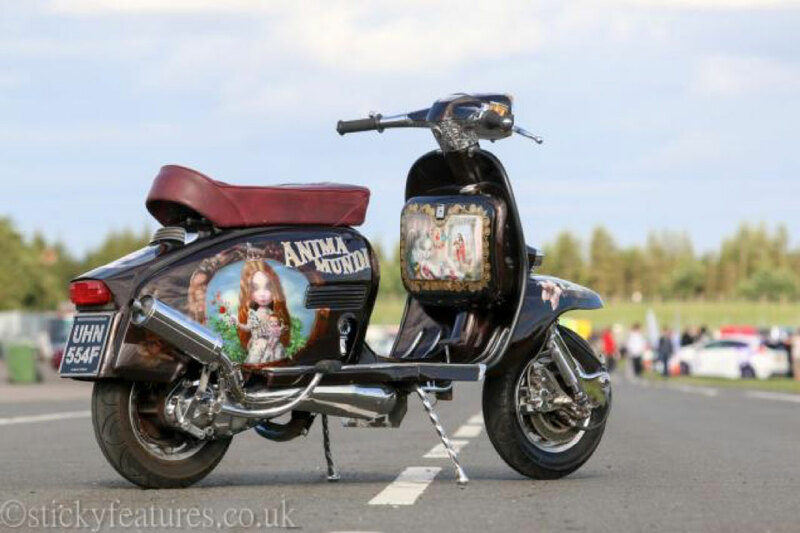 So, you are no stranger to the art of customising, is there a particular Scooter that you have put the most work into? In recent times that would be my wife’s 1959 Maicoletta. It’s a massive German scooter with 14-inch wheels which I converted to accept a 40hp Suzuki DRZ400E engine. It’s been upgraded as subtly as possible with a big front disc brake and hidden radiators, so it’s a bit of a street sleeper. You’d never expect something that looked so old to go so quickly! I probably wouldn’t buy at all! But build something and spend the cash on the bits I couldn’t do myself. There’s nothing off-the-shelf that really takes my fancy. Customising is a great tradition in the UK of using vehicles to demonstrate your personality and taste…or lack of sometimes! It’s very sad to see that in decline with so many people riding/driving boring factory-produced vehicles. People seem to reserve customising to their skin nowadays with tattoos seemingly more popular than modified vehicles. That’s a bit sad to be honest. Nowadays we attend a few rallies and custom shows, but distance isn’t a great object as much as free time. Our scooter club Speed Demons SC is Anglo-German (started in Hamburg 1985) and we used to organise a scooter rally called Holiday in Holland from 1993-2005. We usually ride to the continent once or twice a year, which includes an event called Scooterist Meltdown and is held in a holiday camp built into a never-commissioned German nuclear power station. Generally, I prefer the smaller events where most attendees have made the effort to ride their scooters. The Lambretta Club of Great Britain put on my favourite UK event called Coast to Coast; a one-day ride usually from Yorkshire across to Cumbria via some of the best roads in Britain. In 2015 I came up with a plan for a book called Twin Town Courier. It was to be a ride between Nuneaton and its twin towns in Spain, France and Germany, delivering items from one dignitary to another. That was too easy… so in the end it turned out to be an epic 15-country tour that went as far south as Montenegro and up into Ukraine. 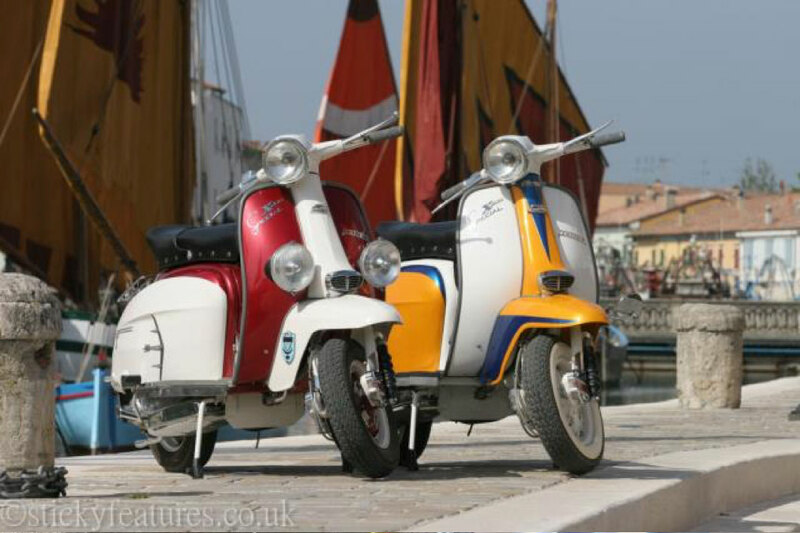 All this was done on a lightly upgraded Lambretta SX200 made in the same year I was born! The trip was remarkable for many reasons, not least of all having to completely rebuild the engine twice – once in Serbia and once again in Romania. I met some fantastic people; particularly the scooterists from former Yugoslavian states, and bike clubs from France and Romania who all helped me immensely. The whole concept for the trip was to let fate control the throttle. For instance, in Croatia the guy who helped me contact the council was a Vespa-riding tattooist, and because we had some free time I ended up letting him give me my first ink. I didn’t set out to do that at all, I just followed the coincidences. It’s very liberating to open yourself to whatever possibilities present themselves. Travel is always an education and a cure for prejudice. The other great event I took part in was Vespa Raid Morocco in 2014. It was a competitive mini Paris-Dakar style event for modified Vespas riding in the Atlas Mountains and on the edge of the Sahara for 6 days. You would ride for eight hours and then have to service your scooter every evening into the night… CL: Wow, sounds full on, but great fun! You can watch highlights of the trip here. I haven’t been able to publish Twin Town Courier yet…but it would be great to find time in the future! You were involved with ScooterLab, do you still write for them freelance? Myself and fellow freelance Iggy set up an on-line scooter magazine called ScooterLab.UK – which consumed a lot of my time and energy. It proved to be a hard slog, but we learned lots. SLUK continues to be both a successful media channel and an on-line shop and I now write for Iggy on a freelance basis. What’s your view on the future of the Scooter scene? The classic scooter scene is maturing with those who take part – there’s very little young blood, so it’s a scene that’ll carry on as long as people can still ride. The problem for those of us riding classic scooters is how long we’ve got before emissions regulations push fossil-fuelled vehicles off the road altogether. I expect that to happen in my lifetime but electric still isn’t a viable replacement yet. Want to know more about how E10 fuel will affect your Scooter or classic car? What tips would you give a young person wanting to get involved with the Scooter scene? With the increasing prices of true classic scooters, the scooter scene has started to become difficult for youngsters to access easily based on cost. In my youth old scooters were still to be found for less than £100, but those days are pretty much over. That said; there are now many modern automatic scooters with retro styling which will often work out a more affordable way to start out. In general, a novice will rarely go wrong buying a genuine Vespa because Piaggio have been scooter masters ever since 1946. The main tip I’d give is to get properly insured and to make sure you lock your scooter with at least one additional security device because theft levels particularly of modern scooters are at epidemic proportions; particularly in the big cities. You can’t rely on the steering lock these days. CL: Great advice Sticky! I’m working on new a book on the scooter scene called Scooterboys – The Lost Tribe which is due for release in Spring 2019. The plan is to spell out the difference between Mods and Scooterboys. I don’t think that’s ever been clearly defined before and yet the man in the street often thinks there’s no difference! For those of us who rode scooters in the heydays of the British rallies, the two scenes were entirely different in scooter style, dress sense and attitude. 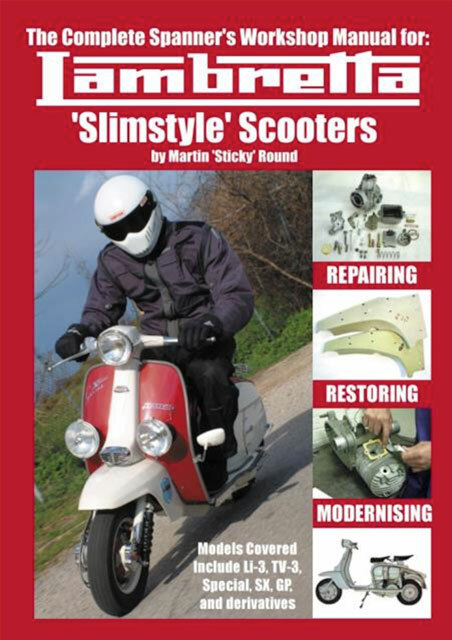 If this book answers the question of why anyone would want to ride hundreds of miles on an uncomfortable and unreliable classic scooter – then I’ll have achieved my target. Sticky, thank you for chatting to us! We are looking forward to reading the next book. Round Britain in 48 hours!